St. Pachomius lived in the Egyptian Thebaid, and is to cenobitic monasticism what St. Anthony the Great is to the eremitic (solitary) way, and what St. Nilus of Sora is to skete life in Russia. He is commemorated on May 15. 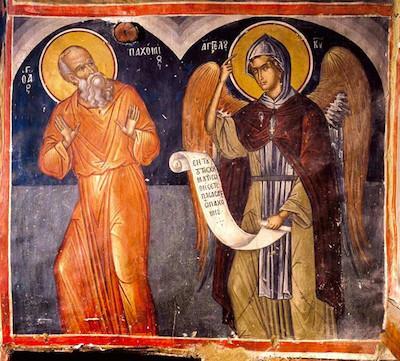 St. Pachomius receives the monastic rule and habit from an angelic messenger (14th c. fresco, Mount Athos). What better way to return to blogging on the North American Thebaid than to share the life of St Nilus of Sora, whom we just commemorated on May 7. 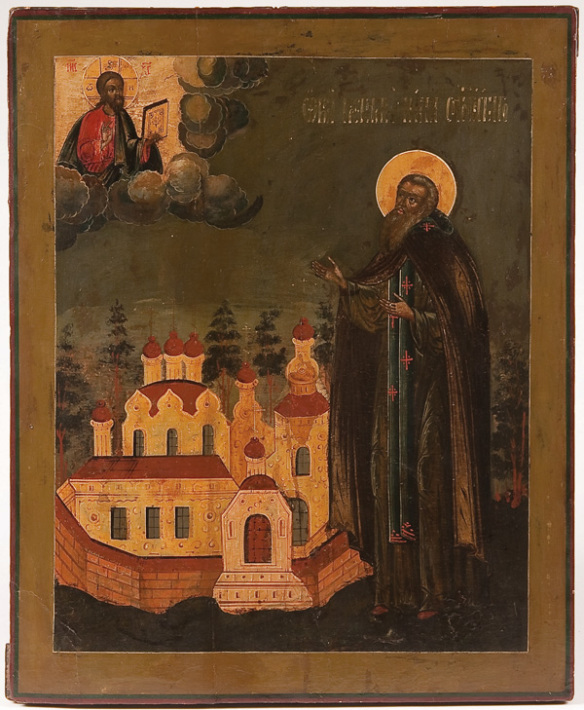 In the Russian Northern Thebaid, Venerable Nilus established the way of skete life, which is often considered the ‘Royal Way’ between the solitary monastic life (eremitic) and communal (cenobitic). In skete life, anywhere from a few to several monks or nuns live in their own separate cells or huts, within shouting distance of one another (in case of emergency), and then join together for the divine services for the Lord’s Day and on major feasts and saints’ days. During the week, they keep their monastic prayer rule and work at their crafts and obediences to help sustain the Skete. Skete life shows the wisdom of the monastic way, as not everyone is suited for close living in community, and only a very few are called to life as a hermit, in complete solitude. It may very well be that here in North America, where we all have become accustomed to living such individualized, idiosyncratic lives, that skete life will be a real option for many monastics as the North American Thebaid grows and matures (should the Lord not return first).